The quest for originality can be demanding, particularly when correct detail is important. 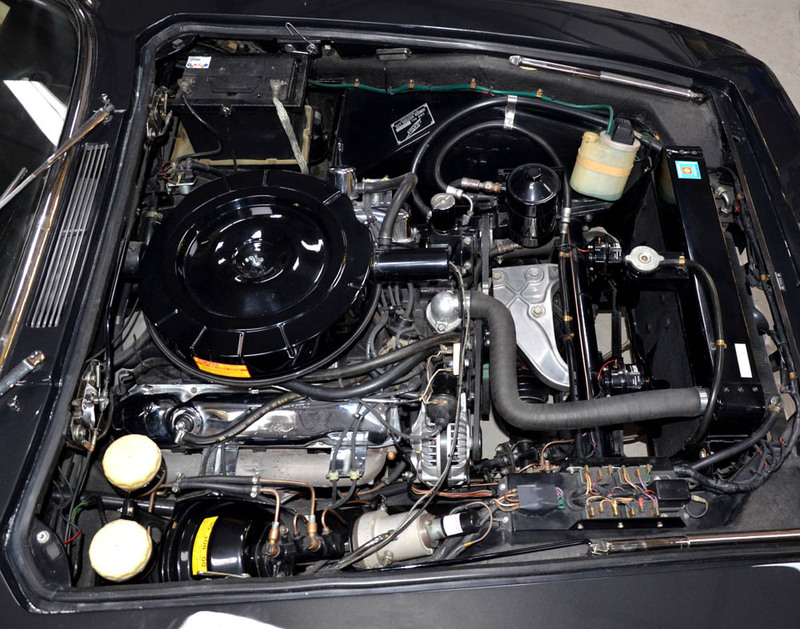 One feature of a Jensen which takes time and expertise to get just right, is the engine-bay. Many decades have elapsed since the cars were first built, and in that time all manner of detail may have been changed. 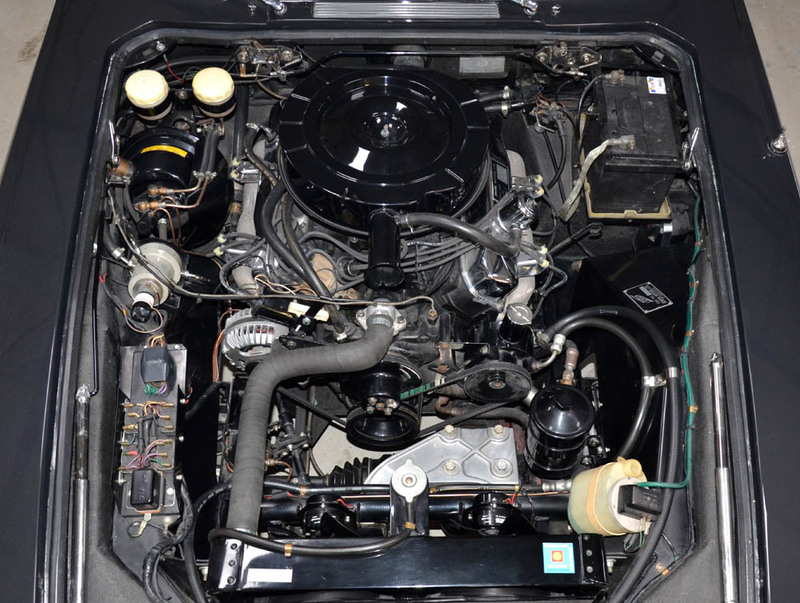 The Museum looks at the evolution of the Jensen FF engine-bay from 1966 to 1971. 119/004 is a Vignale built MK.I FF. Approximately 15 Jensen FF cars were built up at the Vignale factory. By the time the cars were being made at West Bromwich, small changes were already in hand. 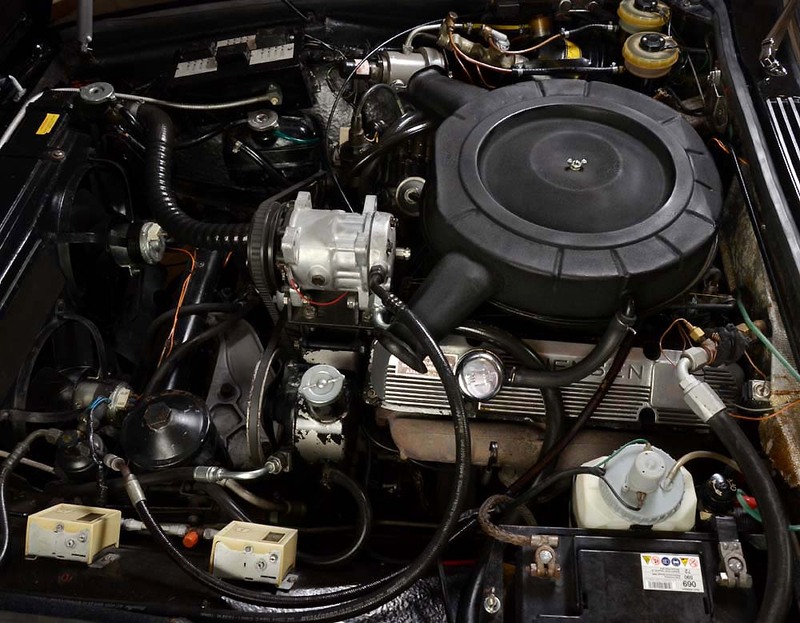 So, although the general layout of the engine-bay remained the same, items such as the radiator were upgraded, and an expansion tank incorporated (fitted just below the fuse /relay section. 195 MK.I FF cars were built in total. 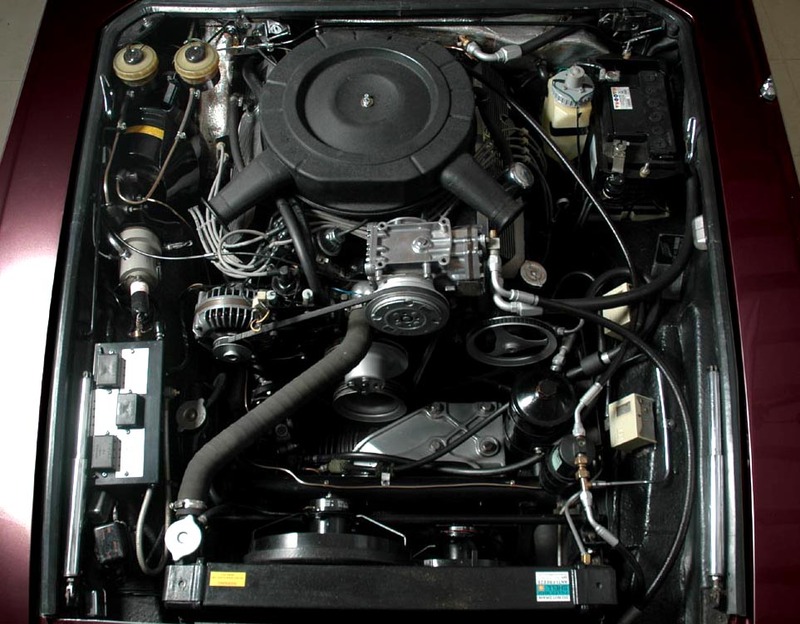 Engine-bay of Jensen FF 119/004. 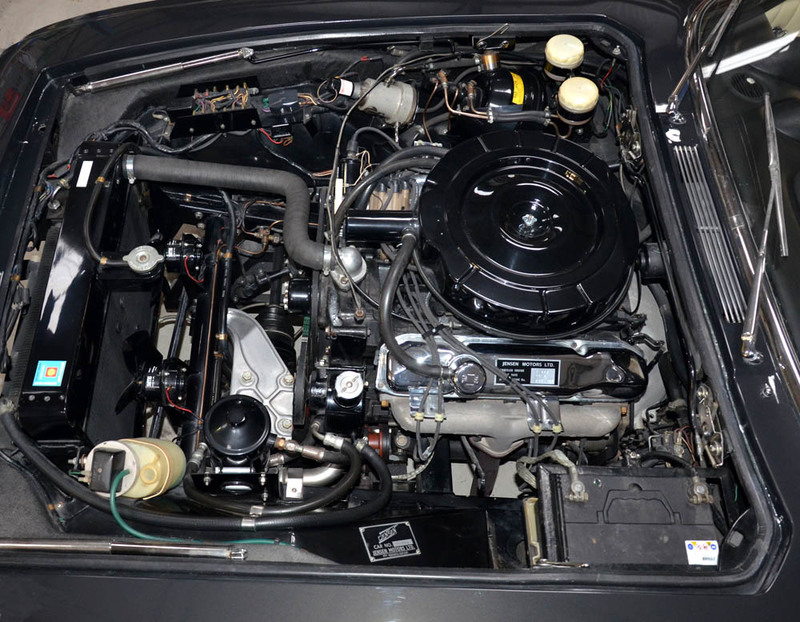 The above image of Vignale manufactured Jensen FF 119/004 shows the initial engine-bay layout with correct details. The Dunlop servo & Maxaret Control Valve can be seen to the upper left of the image. The initial cars from Italy had the early Dunlop brake reservoir cups. Note also the manner in which the brake pipes and flexible hoses have been arranged. The fuse box is mounted forward from the Maxaret Control Valve, and has the four relays open. Later Interceptor & FFs had a metal cover over the top to protect the relays. The early radiator has a central extended filler neck. The robust aluminium front axle top plate can be seen between the engine and radiator. A prototype had been made in black painted steel, and then the aluminium pattern was manufactured and fitted from cars 119/002 onwards. The windscreen water washer bottle was manufactured by Lucas, and was fitted by the radiator on the passenger side. 119/004 engine-bay looking across from the driver side. 119/004 engine-bay looking across from the passenger side. All MK.I FF cars had chromed rocker box covers, as opposed to painted silver rocker boxes on the Interceptor. The small bladed non-shrouded fans can be seen in front of the radiator. These were brought over from the CV8, but heat issues meant that horizontally placed shrouds were fitted later around the fan blades to direct cooling to the radiator. Larger fan blades were also fitted. Note also the small rectangular rubber pads to the corners where the bonnet closes. These were changed to circular rubbers when production was started at West Bromwich. 119/051 is a West Bromwich built Jensen FF. 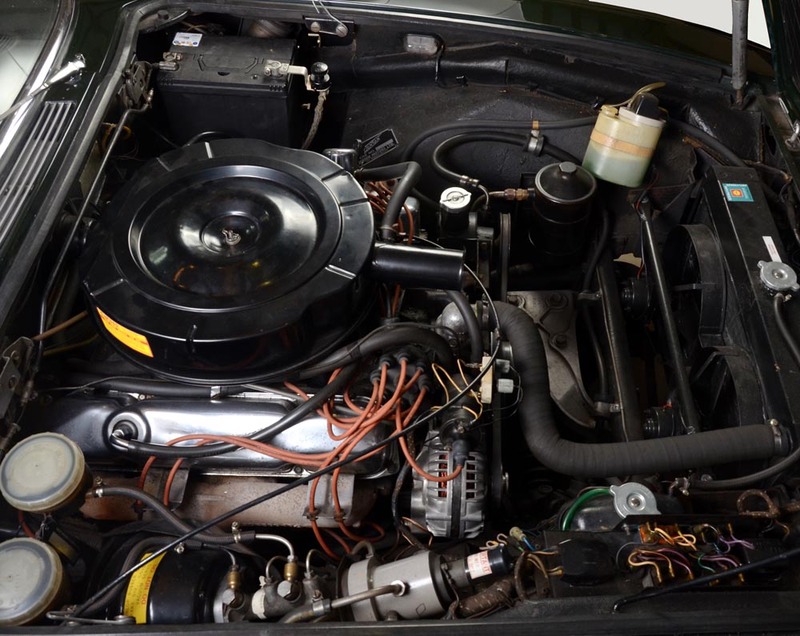 The car has not been restored and the engine-bay remains as it would have looked when it left the factory in 1968. Jensen FF 119/051 was the first FF fitted with Girling brake calipers. 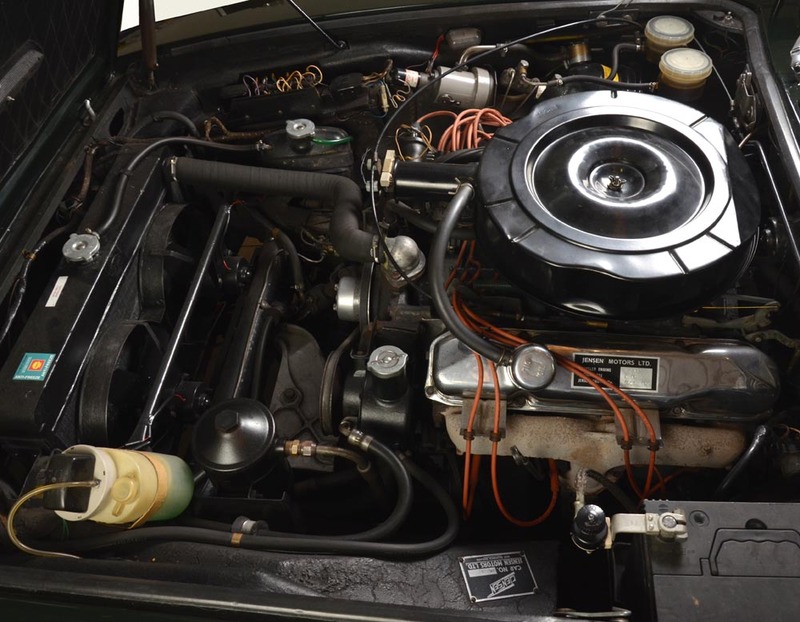 Even although Girling calipers and reservoirs were fitted, the Jensen FF maintained the Dunlop servo throughout the run of 320 cars. 119/051 is an earlier MK.I car, and further evolutions to the engine-bay took place up to the end of MK.I production at 119/195. Engine-bay of Jensen FF 119/051. 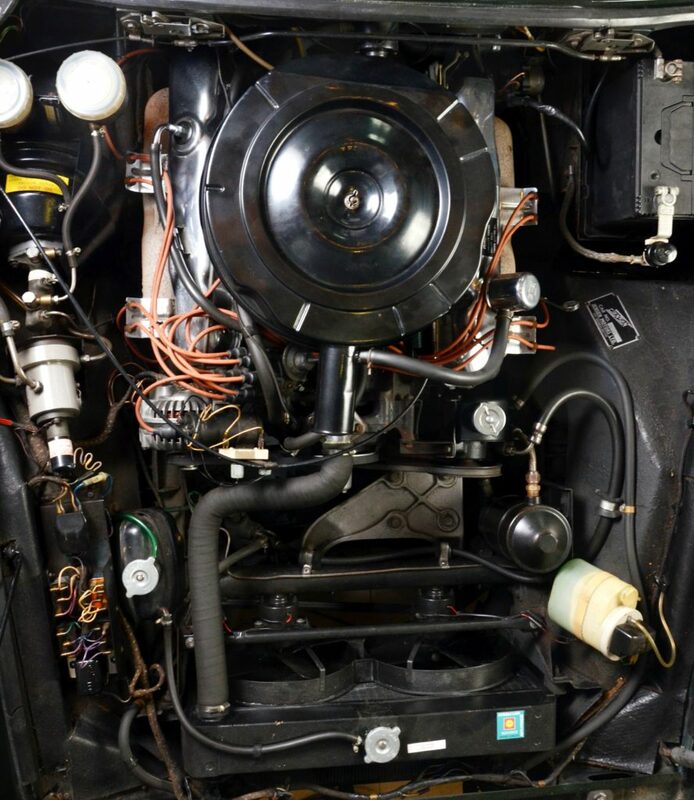 The above image of Jensen FF 119/051 shows the engine-bay layout with correct details.When production started at West Bromwich, one of the first changes was to the cooling system. A different radiator was fitted, along with an expansion tank (which can be seen just by the fuse / relay box). Initially, the factory retained the small bladed fans without shrouds. These were changed for fans with larger blades, along with horizontally placed shrouds to help direct cool air. Girling reservoirs were fitted instead of the previous Dunlops, but initially without the electrical contacts for the low fluid light. 119/051 looking across from the driver side. 119/051 looking across from the passenger side. The horizontally placed shrouds with larger fan blades can be seen in the above images. The expansion tank is clearly visible, sitting just down from the fuse / relay box. Circular rubbers superceded the rectangular rubbers by the bonnet closing corners. The MK.I had seen a degree of evolution, from its beginnings in 1966. However, it was with the launch of the new MK.II model in 1969, that major revisions had been put in place. The much discussed air-conditioning was brought in as an option (although only a few buyers purchased the car without the option). Criticism had also been levelled at the fuse / relay box layout on the MK.I, leading to a completely different housing. 110 MK.II FF cars were built in total. 127/248 is about half-way through the production. 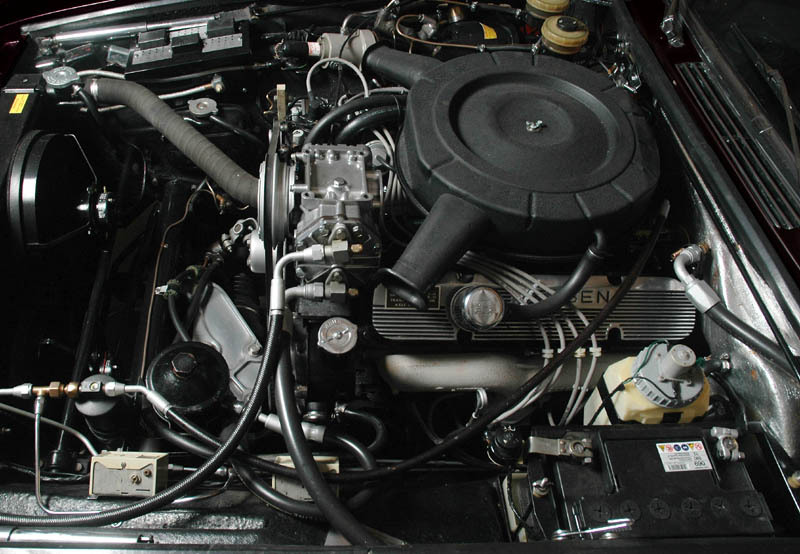 The above image of Jensen FF 127/248 shows the engine-bay layout with correct details. The Dunlop servo & Maxaret Control Valve can be seen to the upper left of the image. The car with Girling brake reservoirs with electrical contacts to the lids to provide low brake fluid warning light. This feature was brought on mid-way through the MK.I Interceptor & FF builds. The MK.II continued to be fitted with the dual funnel air filter can, which was sprayed in black wrinkle finish paint. 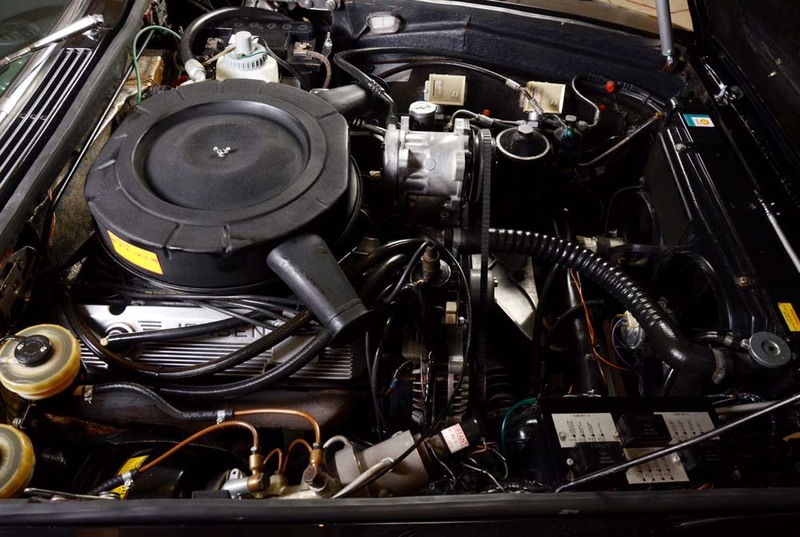 The aluminium York air-conditioning compressor can be seen to the centre of the engine-bay, immediately forward of the air filter can. 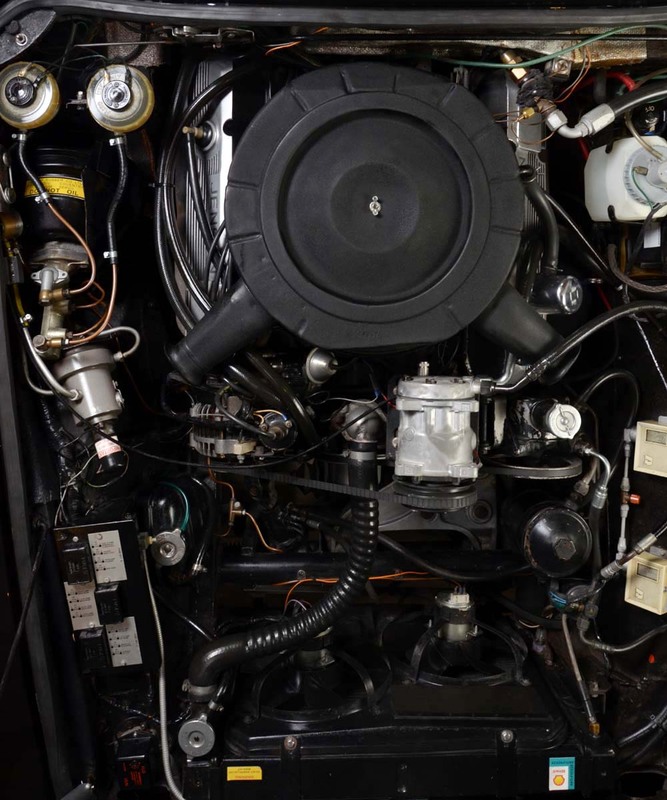 Although air-conditioning was an optional extra on MK.II cars, virtually every car had it fitted. To the passenger side there are the two white regulating boxes for the air-conditioning, and just below one, you can see the reciever/dryer unit. A new style of fuse / relay box was manufactured for MK.II cars, as can be seen to the driver side directly forward of the Maxaret Control Valve. As with all Jensen FF cars, the aluminium front axle plate can be seen between the engine and radiator. A Trico windscreen water washer bottle was fitted to MK.II cars, and was fitted onto the battery cage. In this image one can clearly see the engine sitting over to the driver side. Due to the four-wheel-drive transmission, Jensen Motors had to off set the engine to one side, which allowed the forward prop shafts to fit to the front axle. Engine-bay of 127/248 looking across from the driver side. Engine-bay of 127/248 looking across from the passenger side. For the MK.II Jensen FF & Interceptor, new cast aluminium rocker box covers were manufactured bearing the Jensen name both sides. On Mk.II cars, a silvered asbestos type heat shield was glued to the bulkhead, in an effort to keep engine-bay heat away from the cockpit. On initial MK.II production the material was mostly as per late MK.I, with silver foil glued to standard black felt padding. However, as production progressed, more of the silver asbestos type material was used on the bulkhead area. The radiator and fan set up was the same as late MK.I cars, with the shrouds and fan motors set at a diagonal across the radiator. In a addition to a Lucas engine-bay light, the MK.II had a flexible light. This can be seen attached to the side of the fuse / relay box, and was operated by a white plastic on/off switch. Even before the end of Jensen FF MK.II production, management at Jensen Motors had decided to drop the Jensen FF from their range. As the new MK.III Interceptor was getting close to its launch date, the company had to make a decision as what to do with the FF. There were quite a few FF body shells either built or nearly built, and to have built them up as MK.II cars, may have made them difficult to sell alongside the launch of a MK.III Interceptor. It was agreed that the remaining bodies would be finished as MK.III FFs, in the least expensive way possible. In other words, anything that would involve too much finiancial outlay, would remain as MK.II. Jensen FF 130/325 was right at the end of FF production. 15 MK.III Jensen FF cars were built. Just three further cars were built in chassis number sequence after 130/325, bringing the last chassis number to 130/328. 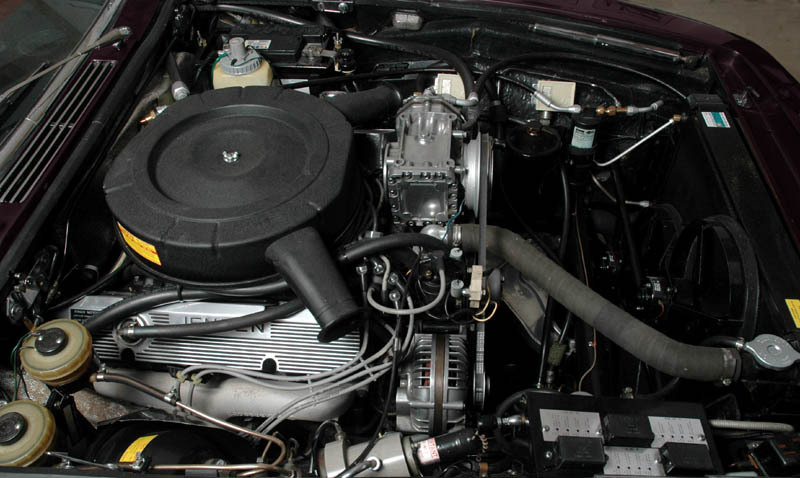 The above image of Jensen FF 130/325 shows the engine-bay with some later modifications. In particular, a Sardon air-conditioning compressor has been fitted instead of the standard York compressor. Many Jensen cars have had this upgrade, as the Sardon (or indeed other modern compressors) works more efficiently than the York. 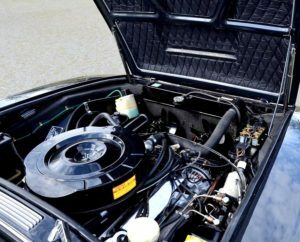 Although the original white boxed air-conditioing regulatiors can be seen to the passenger side inner wing panel, they are no longer plumbed into the system, as the Sardon system doesn’t require them. The MK.III FF has a full radiator shroud, and this is still fitted to 130/325. However, high efficiency Bosch fans have been fitted. From factory the original fans had yellow plastic blades, rather than the black painted metal fans previously used on MK.II cars. Most other features of the MK.III FF engine-bay remained the same as the MK.II. Engine-bay of 130/325 looking across from the driver side. Engine-bay of 130/325 looking across from the passenger side. The engine-bay layout of the MK.III was largely the same as the MK.II. The braking system was the same, although the MK.III FF used ventilated discs, the same as the Interceptor III. The upgraded Sardon air-conditioning compressor can clearly be seen just forward of the air-can. As with the MK.II FF, there is a flexible light attached to the body of the main relay/fuse unit, which in turn trails across to the front of the radiator, where it is held with a special clip.